These pups came across the ocean and straight into our hearts! 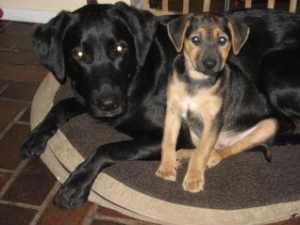 Learn how Newport Animal Hospital and the AARF are finding forever homes for adorable dogs just like these! 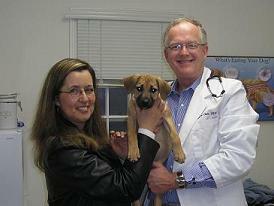 During the last week of February, 2007, Dr. Civic and his wife Sarah traveled on vacation to the island of Anguilla. Anguilla is a tiny island located in the Northern Caribbean, with a population of 12,000, the island spans just 16 miles long and 3 miles wide. The island is known for its sandy shores, crystal blue waters, and average temperature of 82 degrees. While vacationing, the Civics were hosted by Madeline Kelly, a dear friend and local resident. 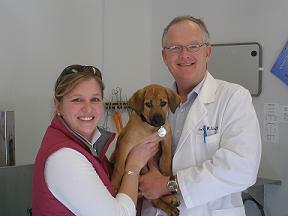 Madeline is a volunteer for the Anguillan Animal Rescue Foundation, (AARF). 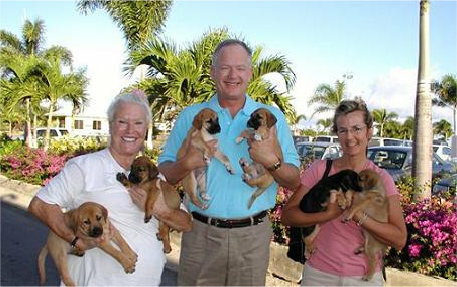 At the time of their visit, Madeline was fostering six, five-week old puppies. After much discussion and planning, Dr. Civic decided to bring the six pups back to Rhode Island for vaccinations, and to find forever homes. After an arduous journey that included a 4 hour flight from from San Juan, Puerto Rico, to Boston, Massachusetts; a train ride from the airport to South Station, and finally an hour long train ride from Boston to Kingston, RI, the puppies found themselves in chilly, wintry Rhode Island. 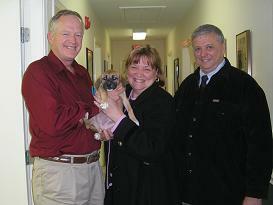 The staff at the Newport Animal Hospital dedicated numerous hours to feeding, socialization, and house training. After three weeks of love and affection, Dr. Civic began to find forever homes for each of these little “coconut retrievers”! 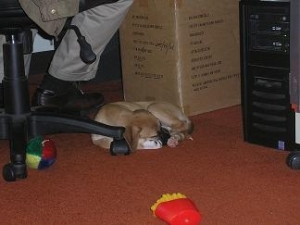 As of March 16th, 2007, all of the puppies had found their new families. 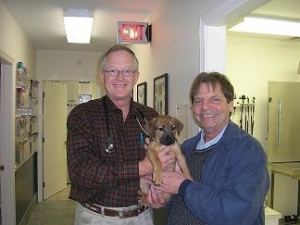 One family met Dr. Civic and his wife on the train ride from the airport, several long time clients welcomed a pup into their home, and two of the pups went to N.A.H families, one of them being Dr. Civic!!! Kenji with her new mom Trice!! Dr. Civic handing off “Fin” to his new mom Lindsey!! Lindsey is also a tech at the Newport Animal Hospital! Kay Lee, the newest member of the Civic family, resting under her dad’s desk!! One of the pups “Marley”, with his new dad Will!! Sweet Sophia going home with her new mom Pheobe and her dad Ed!!! Kona with her new mom Sandra! Below: Kenji and her new sister Kea, resting comfortably at home. 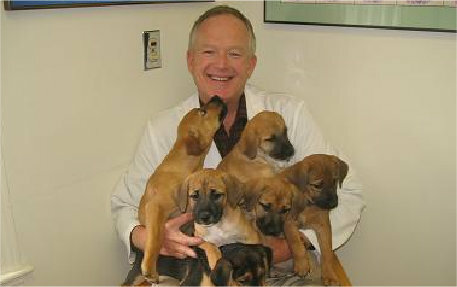 Because the adoptions were such a success, and because the Anguillan Animal Rescue Foundation has so many dogs in need, Dr. Civic donates his time to the shelter at least once a year, and always returns with a new litter of island pups looking for a forever home! Interested in adopting your next pet from Newport Animal Hospital? In addition to the AARF, we also work with the Valley Humane League of Alamosa, Colorado and The Robert Potter League for Animals right here in Middletown, RI. Click here to see if we have any “coconut retrievers” or other animals in need of a home like yours!